Cooler weather means extra time indoors, and extra time indoors means more cooking. Well, at least more time trying to cook. When I’m not distracted by purging and cleaning everything, of course. Honestly, I am finally getting to the point where I no longer feel guilty about not being able to cook homemade meals all the time. Some of us have time for it, and some of us do not. And when I do, it’s absolutely glorious. And when I don’t, I’m learning to power through and just let it be. Superwoman I am not. We’ve been partnering with Blue Apron for a bit now, and they have helped tremendously on the taking it easy on yourself part. They leave the fuss of grocery shopping and the creation of delicious meals to the experts by delivering farm-fresh ingredients right to your front door. On Sunday, I decided to cancel our plans and cozy up indoors. 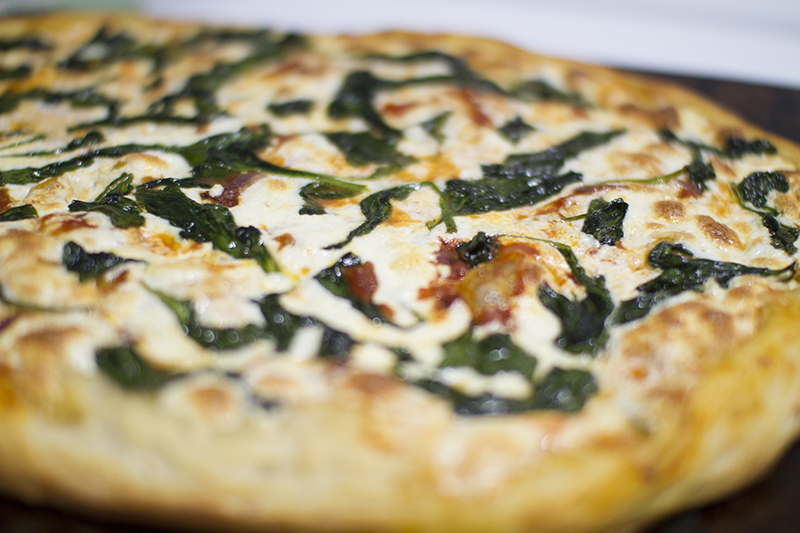 The wind gusts were particularly strong, so I deemed it the perfect opportunity to make a fall spinach pizza. We all agree, it’s a new favorite. Since we have a small kitchen with limited counterspace, I love how Blue Apron’s meals arrive already portioned and packaged for cooking. 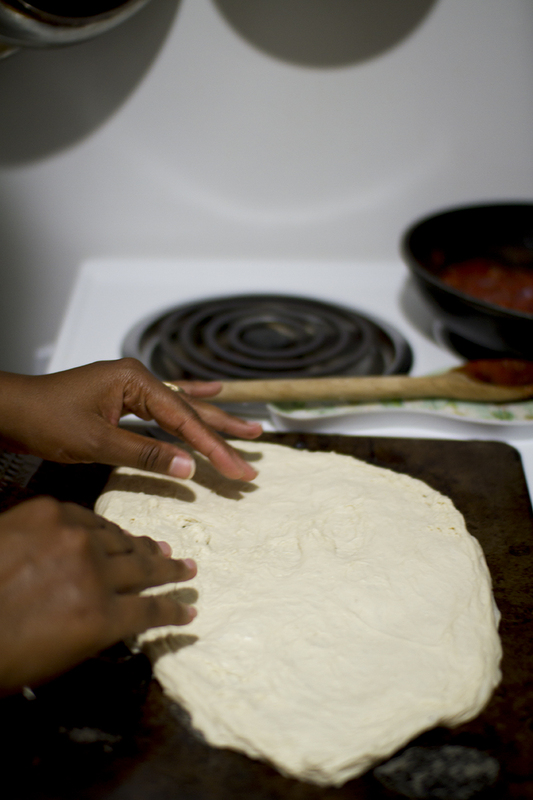 Also, I can’t help but laugh when I do anything with pizza dough, it brings all of these silly memories of when Peter I first met and he worked at a pizza joint, here in Brooklyn. Good times. The pizza was sweet and savory, and felt light on my stomach- which is rare. We followed it up with apple pie and a movie and some snuggling, more fall favorites. -Blue Apron boxes arrive refrigerated, so even if you aren’t home (we never are) the box will still cool on your front door in the hallway of your building. -The ship to most of the country, and there is always FREE shipping. -They recently launched this awesome recycling program! – Lastly, there’s no commitment. Want to give them a try? 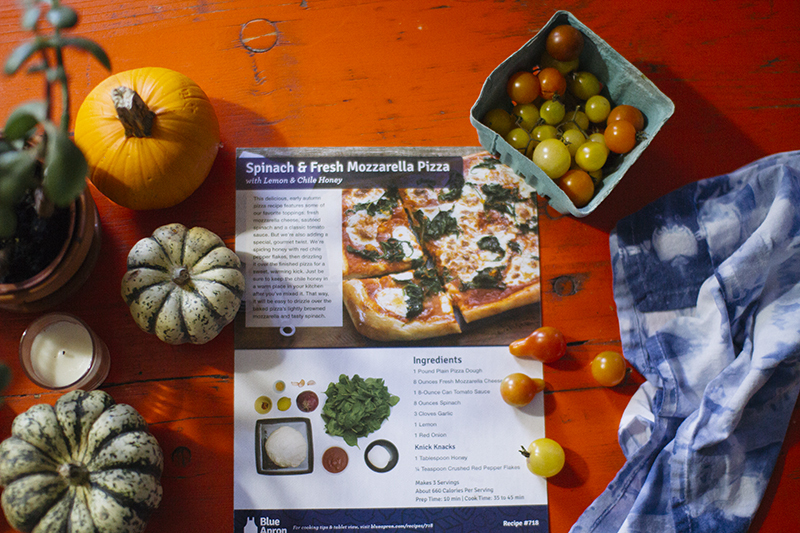 20 readers will get two free meals on their first Blue Apron order! You can sign up right here. 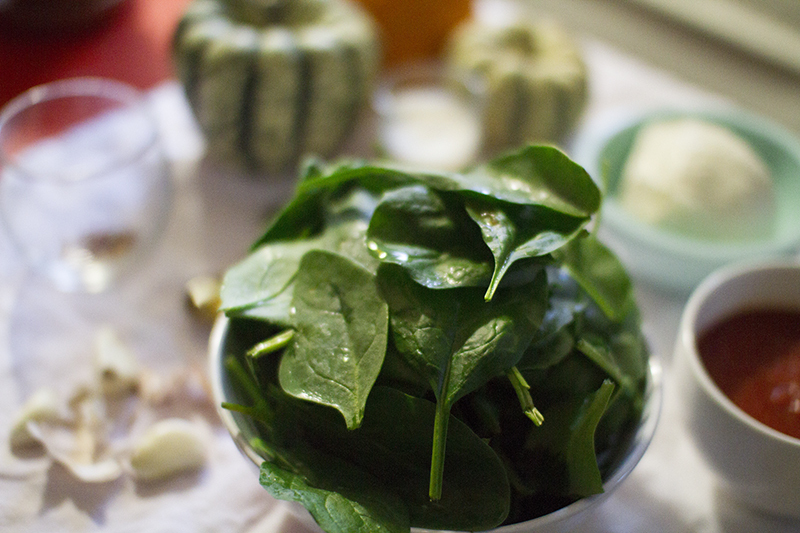 Any favorite fall meals for you? Besides the apple pie, I love making roasted veggies. The seasons, the scent, and the way they carry over into a few different meals- I love all of it. This post was in partnership with Blue Apron. Thank you for the supporting the partners that I wholeheartedly believe in. Pizza is my most favorite thing! And the fact that this at-home diy option feels light on you afterwards? Sold! Lol, beautiful photography as usual. 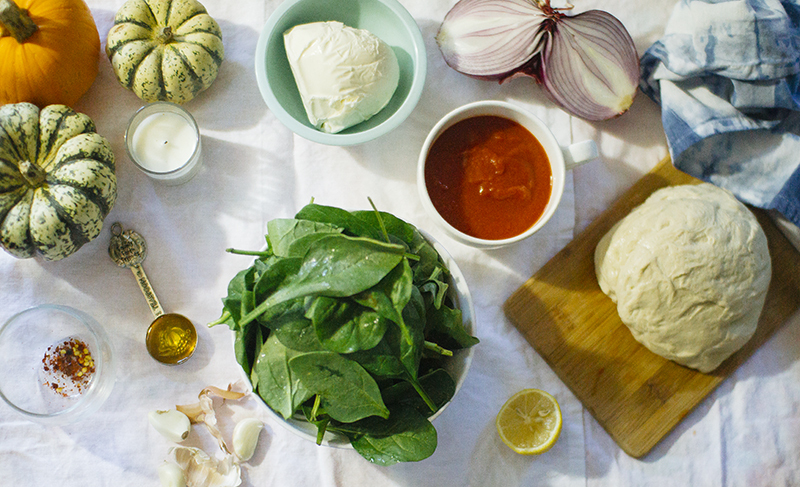 I love roasted veggies, but my favorite thing about the fall are pies. Lots and lots of pies. Latonya, I love all of your posts even though I don't comment on each one! The pic of you in the kitchen is fantastic. How do you manage to BE big and tiny at the same time? And I like your sacred morning routine. I'm going to try that…see a flicker of flame to start the day. Really nice. Thank you. Big and Tiny? I don't know what you mean. But thank you for reading! Oh, the pies! Besides blueberry and apple, I'm not a huge pie fan. I've tried most of them, and just can't get with. 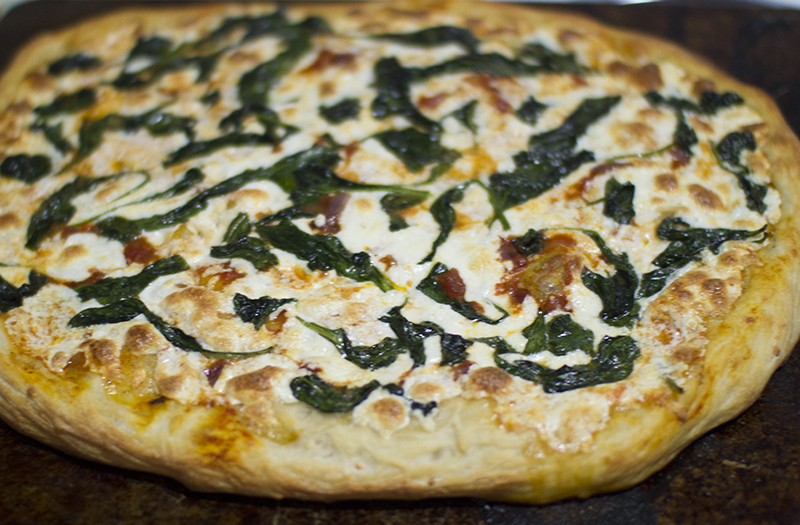 If you try this pizza, let me know if you enjoyed it! Ok I'm going to get into it because I think you are amazing. So you are a sculptress' dream come true: visually you have texture, curves, volume that bounces light and envelops shadows. Attitudewise you express movement, confidence. care, centeredness, and curiosity. All that combined makes me think Big. 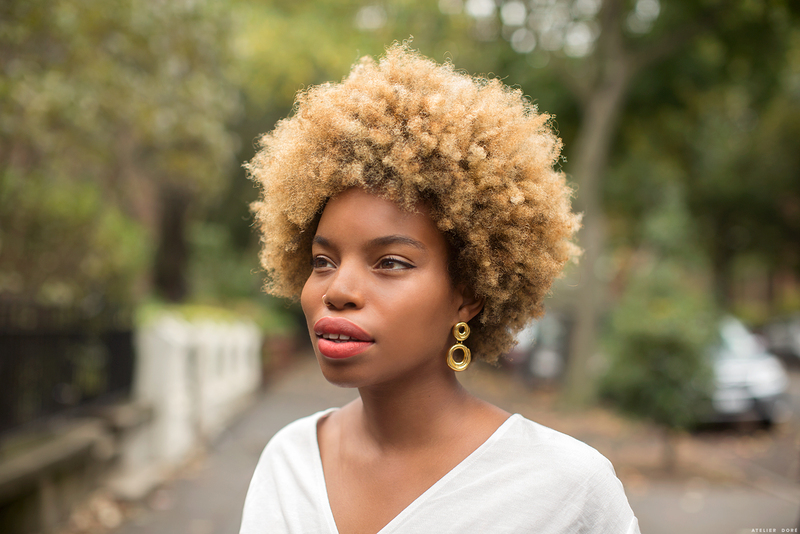 But then the close crop of the photo of you in a little kitchen filled with little things reminds me that you function in a little space filled with earth's things, so… I see Tiny. I'm an artist, so I apologize if all this sounds weird. Just know all this is just to say, you have inspired an artist.